Devotion to Infant Jesus never failed. 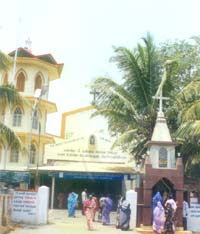 For the growing number of catholic families at Kovaipudur, Coimbatore a small chapel was built by Rev.Fr.Kulandai Raj and blessed in 1984. It was the need of people devotion to Infant Jesus, a novena to Infant Jesus was started and initiated by Parish Priest. Many people came for the novena, that and later a new Church was constructed and dedicated to Infant Jesus and was announced a separate parish on Thursday, 4th June 1987. Rev Fr. Irudhayaraj took in-charge as the first parish priest and aided rapid spiritual growth. By the side of the Shrine, a spacious hall is built for the pilgrims. Infant Jesus and his love, draws thousands of pilgrims to the Shrine on all Thursdays and miracles happen to people of all faiths. It is situated 13 Kms away from the city, lying in the pleasant atmosphere amidst the Western Ghats. A good number of buses are available from the City and special buses on Feast days. Mass Timings: Thursdays ( Mass, Novena & Benediction ) - 11.15 am, 4.00 pm & 6.00 pm. Sundays - 8.00 am & 11.30 am. Weekdays - 6.30am & 6.30 pm. Patronal Feast - Second Sunday of January.